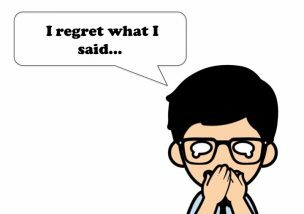 I regret what I said to you earlier. He expressed deep regret for the decision. We regret to inform you (that) your application has been unsuccessful. Unfortunately, we weren’t able to try the restaurant you recommended. My (sincere/deepest/humble) apologies for the trouble. I feel guilty about not calling you on your birthday. We think, much to our regret, that the situation won’t improve next year. I have always regretted not paying attention in class. I’m sorry for not being there when you needed me. It’s a pity you didn’t come to the party. That was insensitive of me, sorry! That was rude of me, sorry! That was silly of me, sorry! I don’t feel very well. I should have stayed home today. You should have talked to her. I shouldn’t have said that. I apologize. I shouldn’t have eaten all that food. If I had payed more attention in class, I would have learned how to speak English. If I had known about that, I would have taken action accordingly. If you had been more careful, it wouldn’t have become such a big problem. If that incident hadn’t happened, I wouldn’t have made that mistake. If I hadn’t said anything, she wouldn’t have gotten so angry. If only I had payed more attention in class! If only I had known about that. If only you had been more careful! If only that hadn’t happened! If only I hadn’t said anything! I wish I had stayed home today. I wish I hadn’t said anything. I wish that hadn’t happened! I wish you had been more careful! I’m kicking myself for not making a copy of my file. I wish I could turn the clock back so I could do things differently. My action weighs on my conscience. I really put my foot in my mouth. I don’t regret a thing! He has absolutely no remorse whatsoever for what he did. If I could, I’d do it again! I won’t apologize for my actions. Thank you for reading until the end! Be careful not to put your foot in your mouth!